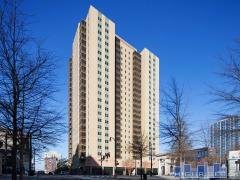 The lofts at 200 Walker St are located in the very hip Castleberry Hill neighborhood near Downtown Atlanta. This 1910s building has Bauhaus style with exposed brick, duct work and pipes as well as huge windows, high ceilings and wide open rooms. Can be used as live/work spaces. Have any comments or questions about 200 Walker Lofts? Ask your question and/or share your thoughts about this Building.